It's coming up to that time of year when the wedding invites are coming in thick and fast. Whether it's a weekend abroad in Sicily or day trip down to the country, what to wear to a wedding spins us all out. But if you follow these simple style rules from our junior fashion editor, Lucia Debieux, there really is no need. 1) Think maximum impact with minimum spend. The high street is all over the statement jewellery trend that just won’t go away. Yes, Jon Richard, Next and New Look, I am talking about you. Bravo! The bold bright colours and shots of crystal jewels scream on-trend and will pretty up a simple shift. 2) There are some great show-stopper dresses hitting stores for spring/summer. Digital print shift dresses at Oasis and Pied at Terre @ House of Fraser are always a sure fire way to make a entrance. 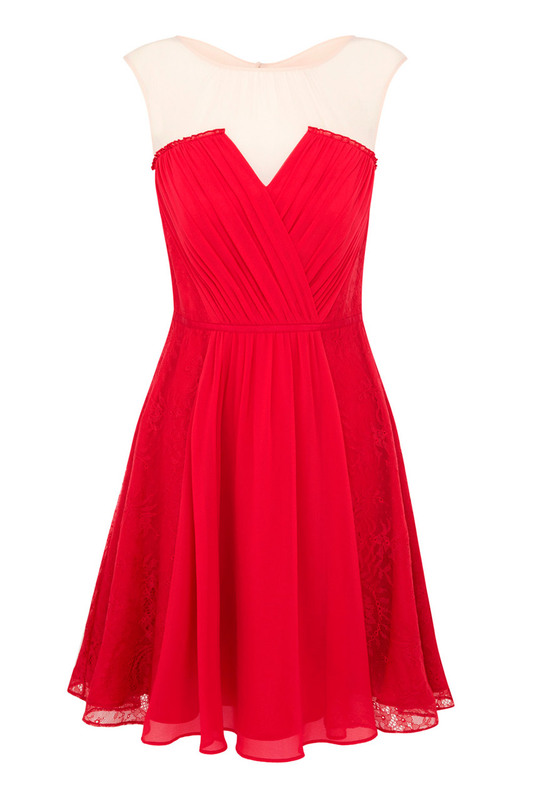 Try a bold colour with Coast’s ‘Mineraux’ red dress (£145). It’s got ‘inspired by Lanvin’ written all over it! Or, try a billowing maxi dress, Dotty P have the most stylish ones on the high street. 3) A take on the classic tea dress suits most shapes and works for any wedding occasion. Plus, who doesn’t love a flattering sleeve on a dress? Perfect for those weddings when its appropriate to be a little more demure. I have my eye on the ‘Petal Pansy’ dress from Olivia Rubin (£190), the ruching detail at the front is quick fire way of giving the illusion of a flat stomach, with all that fabric skimming past your curves. The Ganni ‘Dotty’ Dress (£120) and the Libelula ‘Birdie’ dress (£125) are other prim and perfect dresses to make a entrance in. 4) Keep it stylish and say no to the dreaded pashmina your auntie bought you for Christmas. If you must have a scarf over your shoulders make sure it’s cashmere so it will actually keep you warm while waiting around. Go for one with a hint of neon like the stunning creations from Rose and Rose, which are sure to edge up even the most safe of outfits. Look out for others with frayed edges for a new spin. 5) If celebrating in the heat, think about fabrics and fit. As a rule, try natural materials such as rayon, cotton and linen. Step away from the body con and go for something long and loose. Miss Selfridge have a good selection. Just add an armful of gold delicate bracelets and a chunky metallic strappy sandal. Try Next for their metallic peep toes and you’re good to go. 6) Go mini with your bag. Leave the bulging work bag at home and splash out on a Russell and Bromley shoulder bag. There’s enough room for the card, compact camera and confetti. Wear across the body so your hands are free to catch the bouquet! 7) Walk tall in a pair of hero heels, keep it high end in a classic but elegant pair like Office ‘Obey Me’ heels (£55). The minimal design, favoured by Rihanna, works with everything from a skinny statement trouser, 60s shift dress to a pleated midi skirt. If you must wear flats make sure it’s a bold bejewelled pair and team them with a pedi in a fun glitter shade – one of summer’s hottest trends. 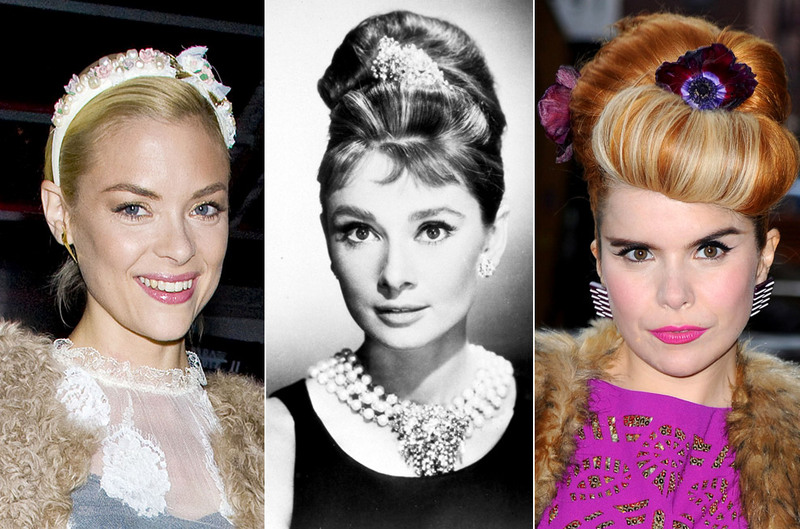 8) Opt for a fancy floral headband. Fascinators are so last season, dahling. Keep your jewellery minimal, just simple classic earrings, so as not to take away from your headpiece. The floral crowns from Beauxoxo.com are a must-have with a winning price that’s worth it if you lose it on the dancefloor at the end of the night! 9) The fash-off of the summer is the ruffle vs. the peplum. If you haven’t embraced the peplum yet, there’s still time. Next, Whistles and Reiss have all teamed a simple peplum shell top with a pair of fancy pants, go for matching tonal colours in textured fabrics, like brocade, for extra fashion points. Sling a slouchy blazer over your shoulders and voila! 10) Been invited to the swankiest wedding of the year with a matching swanky crowd? Somehow I think last year’s dress won’t cut it. If you are going to mix it up and try a brand new spanking on-trend look, preparation is the key. Try it on, then try it on again, and again with your accessories. There’s a reason why you always go back to your safe LBD because you feel comfortable and confident in it so you need to recreate that feeling with a new piece. Don’t risk it and think it will all fall into place on the morning of the big day. Look in the mirror, see how it fits while dancing, sitting and embrace it. I would say mix it up and turn heads in a jumpsuit, the best ones are at Saloni and Raoul with halterneck designs. Add a super high heel, a printed pochette bag and a huge smile.